So there we were, back in Almerimar three years later, some four thousand more miles under the keel and not a thing had changed. We only stayed in Almerimar for a couple of days. Enough time to stock up on supplies, sell some unwanted gear and meet up with old friends. We managed to borrow a car for a day and went to the supermarket to stock up on supplies. Stocking up takes more time than expected, not only is there the bulk buying which requires each member of the family to have two shopping carts. 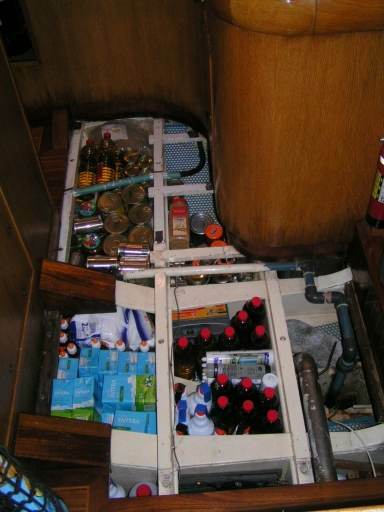 There is also the difficulty of getting every thing out of the car and onto the foredeck (we were bow to), and down my hatch. Once everything is downstairs labels have to be taken off tins, their contents written on the lid with permanent marker. Flour, rice, sugar and all bagged goods are placed in zip-lock bags. The 10-kilo bag of dog food is opened, its contents also divided into numerous zip-lock bags and put to one side. When all the supplies are labelled, the packing begins. After being stowed they are marked on the 'Wherezit list', a list containing the information of where everything on the boat is and the quantity. To any onlookers we seem to speak our own language with phrases like; " Beans baked 402 galley und sole five add" and " Oil-olive green, 343 sal stbd two add." Dad has described our 'Wherezit list' in full in 'The Boat' section of the web page. Selling unwanted gear at the boat jumble was also something that required doing. Not wanting to bring anything back we practically gave everything away. Although we should now have a lot of free space on board it is not so, we still have to play 'Fed Ex' and deliver some gear to a fellow diver who is in the Caribbean. Even with a lot of jobs in the 'air' that required attention I still managed to have time to roller blade and spend time with Chris. We left Almerimar for an over night sail to Ceuta, the 'Spanish Gibraltar' on the Moroccan coast.